Probably you have already seen iDEAL QR codes in your daily life. 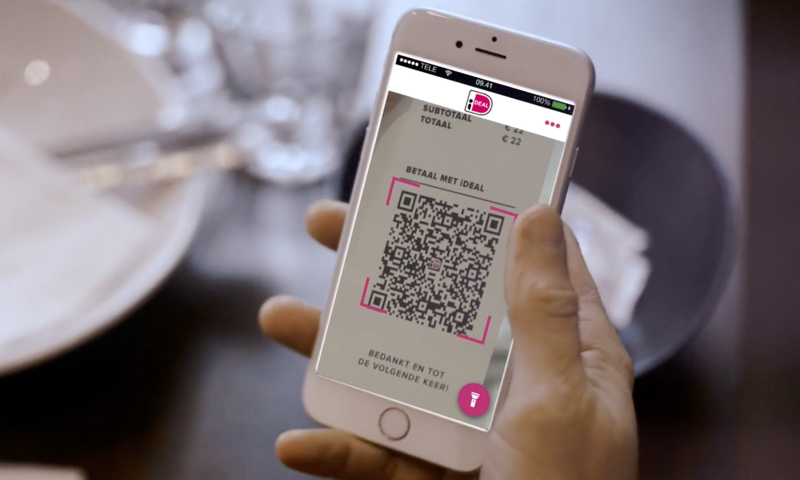 Paying of or receiving an iDEAL payment using a QR code is nowadays possible too. You can find QR codes on invoices, bills, screens (phone, TV, laptop, shop displays, etc. ), billboards and posters. You can recognize an iDEAL QR code by the iDEAL logo in the middle of the code. Also the other Dutch banks are currently working on the integration of a QR scanner in their own mobile banking apps. If you are a customer of another bank, please use the iDEAL app. Install the mobile banking app of your bank, if you have not installed it already. Or download and install the iDEAL-app in the Play Store of Google (Android) or the App Store of Apple (iOS) on your mobile phone. Scan the iDEAL QR code with the iDEAL app or the mobile banking app of Rabobank or Knab. Check the payment details. Sometimes you are able to change the amount, for example to donate a higher amount or to give a tip. You are now being forwarded to the mobile banking app of your bank. In this app you can make an iDEAL payment just as you are used to. After the payment you return to the confirmation page of the payee/company. As a consumer, you can use the iDEAL app to generate QR codes and to present them as a payment request to another consumer. It provides a secure and reliable way to make a ‘consumer-to-consumer’ payment without sharing each other’s phone numbers and bank account numbers. This may for example be very useful during garage sales, flea markets or sales at the door. Please click here for more information about the iDEAL app. Other questions about iDEAL QR? If you have additional questions about iDEAL QR, please consult our complete list of the frequently asked questions and answers on our website. Please watch the video and in just a few seconds you will see how easy iDEAL QR is.